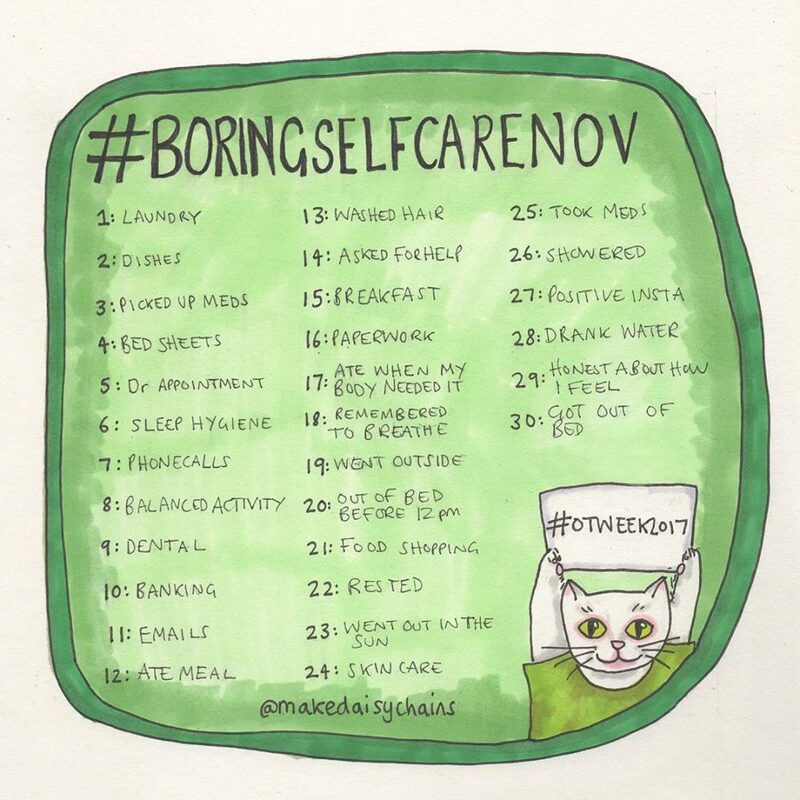 Boring Self Care Nov (#boringselfcarenov) A project by Hannah Daisy, an occupational therapist based in the UK. Hannah would like to raise awareness on occupational therapy ‘Practically no one knows what an occupational therapy (OT) is or what we do. Even some people I work with.’ and because I had such an excellent occupational therapist after my brain injury I would also like to raise awareness. The second week of November is also Occupational Therapy week in the UK so I’ll be writing a blog post to talk more about my experience. I mentioned yesterday in my Laundry post that Stephen and I have just moved into a rented house, and with a rented house comes rented problems. We’ve rented a dishwasher problem, the rubber comes off every time you open the door. Now, this may seem like a little problem but wow does it make me angry. Another thing that makes me angry? It isn’t a good dishwasher, it only cleans about 40% of the things you put in. Dishwashers are supposed to be very helpful, we had one in our previous house and it was… It saved so much time. This rented dishwasher adds time because you have to check all the dishes that comes out, wash most of them up and this adds to my fatigue because I end up spending more time doing dishes than if I were to simply hand wash them. I’ve given up on the dishwasher and I now wash everything by hand. I don’t like getting frustrated about something as little as this but I can’t help it. Another thing about dishes when you have a brain injury? In the four years and eight months since my injury I have dropped so many things. Mugs, glasses, plates, bowls, nice wine glasses and so many other things. I did have a list of all the things but I stopped adding to it and threw it away because honestly, it was depressing to look at. A tip? If you have a set of glasses (especially nice ones) only have the amount you need out. Stephen and I have two wine glasses in the cupboard and the rest in the box they came in, safely tucked away in a cabinet for when guests come round. We learned this the hard way, this is actually our third box of glasses. Are you taking part in the Boring Self Care? You can read more about it here. How is doing dishes for you? Next Post #BrainQA, Question 15: How often do you get overwhelmed?